HOUSTON: On 10 July 2014 Mr. Alfredo Rodriguez was installed as the new State President for AUSA 4th Region – East Texas. He was administered the oath of office by Stan Lenox, III – AUSA 4th Region Executive Vice President. The State President for East Texas covers the areas of Houston and Austin and more specifically the Houston Metroplex Chapter and Texas Capital Area Chapter. Rodriguez previously served as the President of Houston Sub-Chapter from November 2012 to February 2014 and then as Chapter President of the new Houston Metroplex Chapter from February to June of this year. State Presidents are members of AUSA and are appointed for a specific State. They are appointed by and report to the Region President. State Presidents are key members of the Region staff and take an active leadership role in the Association. They are consulted by Chapters, Regional and National on all matters pertaining to chapter operations within their state, particularly the formation of new chapters and the revitalization of chapters at risk. The term of office and tenure in the appointment is established and controlled at the direction of the Region President. 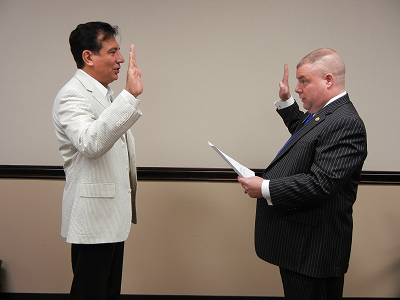 Alfredo Rodriguez – State President of East Texas (left) being administered the oath of office by Stan Lenox, III – 4th Region Executive Vice President.